The right, talented people, together for your project. 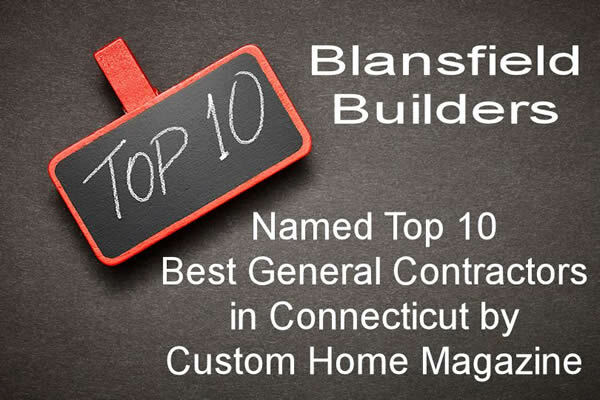 Jim Blansfield, of Blansfield Builders, has his own version of a Top Ten list which has kept him in the forefront of building in the southwestern Connecticut and Westchester County, New York areas for the past 25 years. It includes Knowledge, Craftsmanship, Commitment, Professionalism, Customer Service, and Financial Stability. Blansfield Builders proudly offers a five-year warranty to their clients. We have been building and remodeling since 1985. Our solid knowledge of construction is constantly being expanded to guarantee that we continue to keep in step with new products and innovations. Our skilled tradesmen have the knowledge and experience to deliver the highest quality craftsmanship and detail. In order to provide the caliber of sophistication preferred by our customers, we are pleased to facilitate the work of many well respected architects taylored to your needs and style. We are driven to provide detailed quality construction and are extremely proud of our work. The professionalism of our tradesmen is as important as the quality of our work. Honesty, trustworthiness and integrity are criteria for employment with Blansfield Builders, Inc.
Blansfield Builders works to provide the service and support the customer deserves before, during and after their project. We offer ideas, provide information on new products and will follow through to help with all questions and concerns during a project. We have strong credit lines with all of our suppliers and are Dun and Bradstreet rated (#13-175-5365) since 1987. Our well organized office is equipped with the latest in computer and telecommunications equipment, and our project management based staff has the skills to maximize it's use. Our company is the proud recipient of numerous local and national awards. We offer a 5 year warranty. Most builders warranty only the first year after construction. We are particularly proud to offer this to our customers. Blansfield Builders, Inc. is well versed in the design/build approach to homebuilding and has had the privilege of working with a number of renowned architects. These architects have found Blansfield Builders, Inc. to be competent and thorough in the administration of their projects. References will be provided upon request. We are eager to discuss new projects with architects or we can recommend an architect whose style is in harmony with the desires of the client. We are happy to provide a list of professional and client references to owners and architects interested in working with Blansfield Builders. Please contact us at (203) 797-9174 or use our contact form.